Gregory Hancock Dance Theatre offers a variety of youth programs specifically designed to serve students. 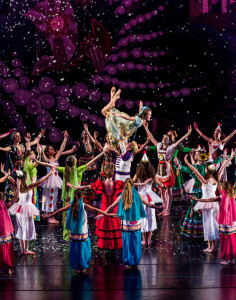 The company produces an “all-student” production of “The Nutcracker” for the holidays. The cast of over 100 dancers ranging in age 6 through 20 presents a magical contemporary version of the holiday classic. The production does not utilize the traditional Tchaikovsky score, but a unique score comprised of music from film and traditional world music. The Act II international variations feature dances from Spain, Russia, India, Africa, China, Mexico, America, Turkey and France. Klara, a homeless orphan girl who sleeps on the streets in cardboard boxes is given a broken Nutcracker doll by a mysterious street person. The doll magically transforms her sad life into a joyful, magical world. Klara and the people from her world discover the true spirit of the season through the gift of love. This heart-warming production has become an audience favorite with six performances offered in December. The company also offers a special school matinee for school age audiences. The Nutcracker is perfect family entertainment for the holidays. Gregory Hancock Dance Theatre offers training and performance opportunities for young aspiring dancers age 13-19. The student company meets twice weekly to receive training in modern dance and ballet, learn repertoire from selected company pieces and learn choreography created for the student company. The student company presents a repertoire concert each season. Members from this company are selected to appear in company pieces occasionally when extra dancers are required. Dancers from this program also have the opportunity to become trainees and/or apprentices with Gregory Hancock Dance Theatre. Acceptance in the program is through invitation.